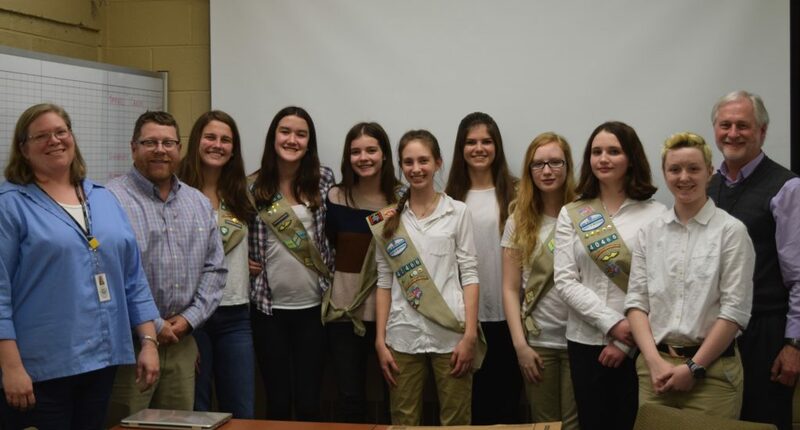 Members of Girl Scout Troop 40466 with Ann Arbor City Council member Chip Smith, Slauson Principal Rick Weiler, and city staff members. A renewed focus on pedestrian safety has led to improvements around many Ann Arbor Public Schools in the last few months. Superintendent Jeanice Swift, Huron High School Principal Janet Schwamb, and then School Board Trustee Andy Thomas called for the changes at an Ann Arbor City Council meeting following the death of Community High School Junior Justin Tang. Signs now alert drivers to the crosswalk in front of Huron High School Tang was using when a driver hit him. The city has also installed reduced speed school zone signs around Huron and other schools. While these are some of the quick changes that have been made, AAPS and Ann Arbor officials are taking a deeper dive looking at pedestrian safety around all schools. 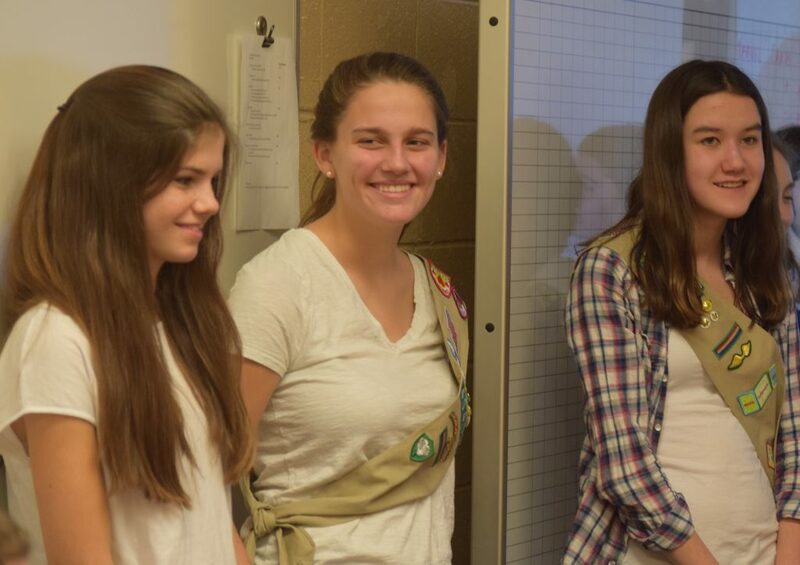 When it comes to Slauson Middle School, they have an ally in Girl Scout Troop 40466. Members of Girl Scout Troop 40466 listening to the Transportation Safety Committee discuss their research on pedestrian safety around Slauson Middle School. Eight members of the troop attended a meeting of the Transportation Safety Committee this week to share research on pedestrian safety around Slauson they’ve been working on for over a year. The research includes surveys of students, parents, and residents that live near the school and observations from watching morning drop-off. Some of the highlights of the research includes the fact that 49 percent of students are dropped off, 85 percent of Slauson parents and neighbors want to see safety improvements, and 77 percent think there is a congestion problem near the school. Elizabeth Blackwell was the lead presenter for the group. She’s currently a 9th grader at Washtenaw International High School, but attended Slauson. “One of the hardest things was just gathering all of the data because we needed to have a lot of it so we could have a really representative sample of parents and neighbors,” she said. Blackwell was pleased with how the meeting went, and was excited to see all of the important players in the room at the same time. “I think it’s incredible how the city and the schools have come together to find a solution to this,” she says. 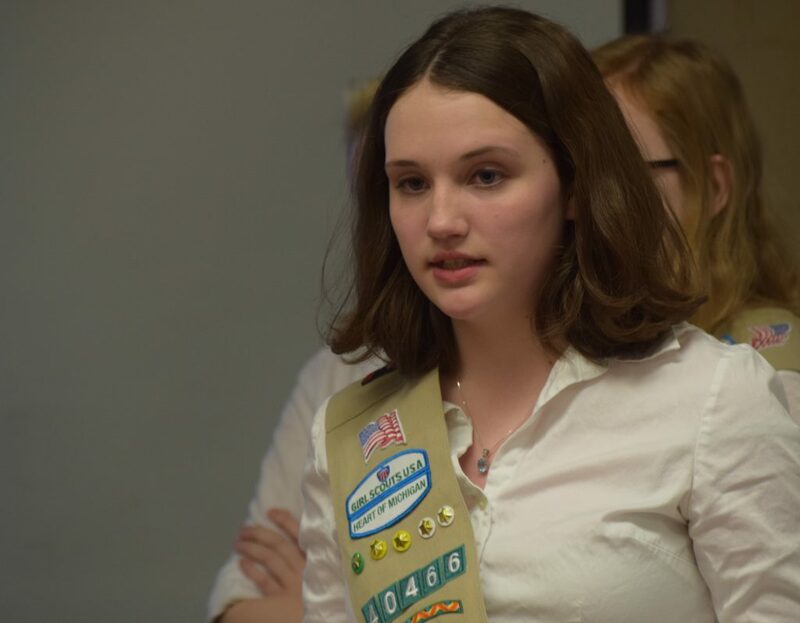 Elizabeth Blackwell shares Girl Scout Troop 40466’s research with the Transportation Safety Commitee. The solutions the girl scouts suggest include not allowing parking on Washington during drop-off and pick-up times, adding a pedestrian crossing on 8th Street, and moving the location where buses drop-off students to Crest Street so that the current location on 8th Street could be used by parents dropping off students. Ann Arbor City Council member Chip Smith says their presentation was impressive. “These girls did such a great job with their research, with their presentation, with their methodology. I was really blown away by the quality of their work,” he said. While Smith and others in the community have been impressed with the work of the troop, Blackwell was equally impressed with the response they received from the community. “I think it’s fantastic how the parents we talked to and the neighbors have shown an interest in this and are passionate about making schools safer,” Blackwell said. As for the girl scouts next steps, they’ve been invited to go to the AAPS Bus Garage to talk with transportation officials after they’ve determined how much space is available on Crest and at other possible locations around Slauson to see if bus drop-offs could be moved. 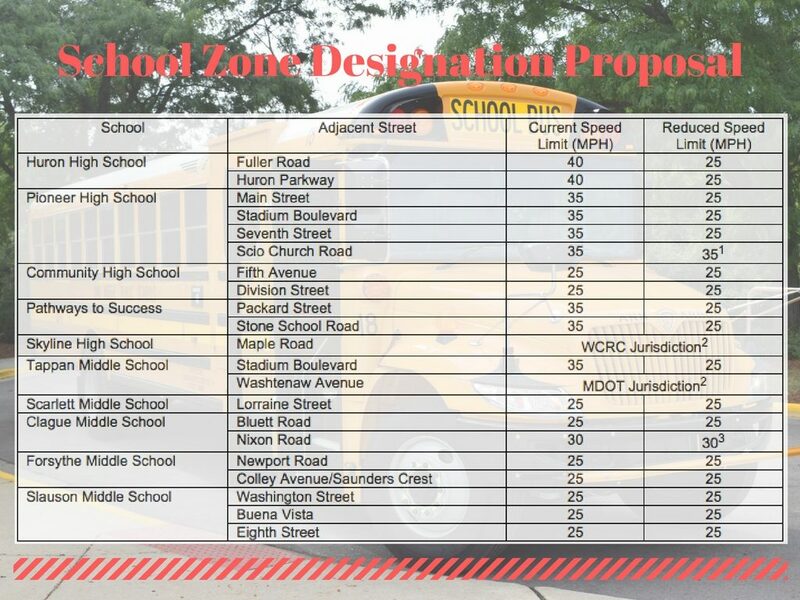 The highlights of Ann Arbor officials’ review of possible school zone designations. Thanks to Girl Scout Troop 40466 for their commitment to Civic Service and particularly pedestrian safety. As a member of the Clague Middle School Safe Routes to School Committee I appreciate the hard and long work necessary to collect valid and reliable data. I can also assure you that the Board of Education will continue to work with the city and with the community to help make school zones as safe as possible. Excellent to see the Girl Scouts supporting civic engagement on such an important issue and to see girls collecting and analyzing data and getting involved in local government and policy work!